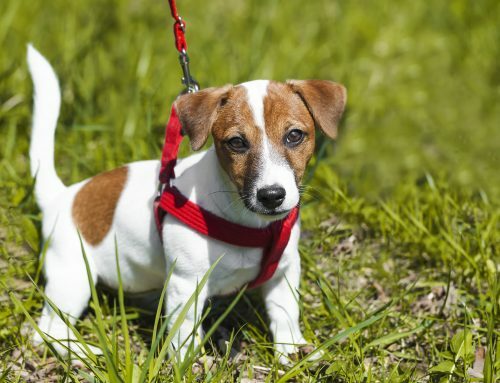 Having an elderly pet is very challenging – especially in the cold winter months. Todd and I own a 15-year-old Golden Retriever, Winnie. She is blind and has very limited hearing. She can hear high-pitched sounds or a whistle, but the loss of sight and hearing has made keeping her conditioned and exercised more than a bit tricky. As she was starting to age it became increasingly difficult for her to go on long walks with us. She became very sore and often wandered too far from us to hear or see us. It was apparent that we needed to find an alternative to hiking to keep Winnie in good shape. Thankfully, Winnie loves to swim. We decided to make swimming a routine part of her training regimen to maintain her weight and muscle tone as she aged. The warm water of the pool (heated to 80 degrees) helped her muscles “warm-up” which helped her to relax and assist in her blood flow. It has also improved her range of motion. As Winnie aged, her eyesight continued to degenerate. We had to retrain her to become patterned to the spot at which her toy would land in the water so she could use her nose to locate it. She picked up on that very quickly. Eventually, Todd had to start assisting her in getting in and out of the pool. 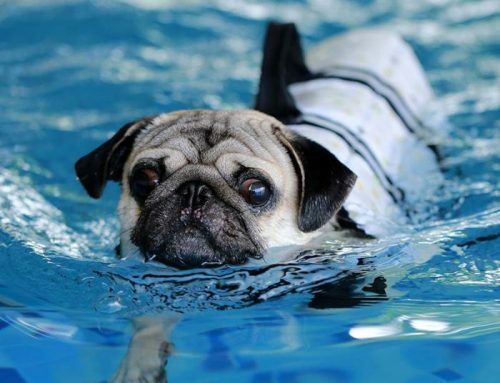 Fortunately, he is used to this from his years of experience in assisting the dogs that use our pool for rehabilitation. Once she is safely in the water, she thoroughly enjoys swimming laps to retrieve her toy. With periodic rests to catch her breath, she has the endurance to stay in the water for 20-minute sessions. 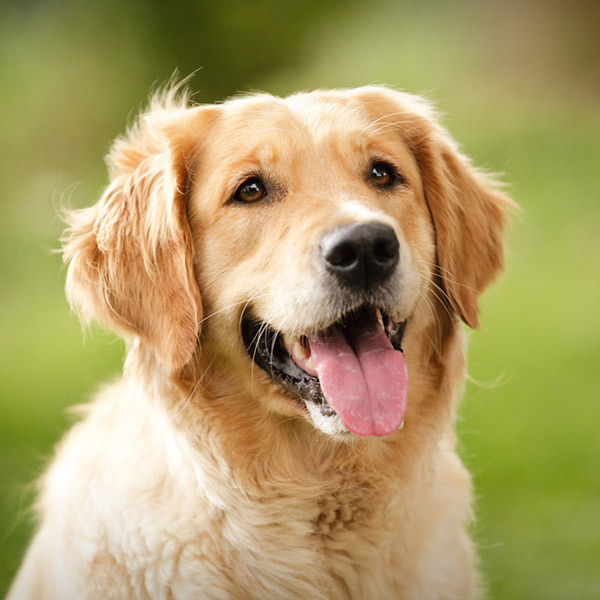 It may surprise you to know that for a dog, one minute of swimming is equivalent to about 4 minutes of running (Dr. Arleigh Reynolds, Veterinary Surgeon and Canine Physiologist) so even a 15- or 20-minute swim gives her a great cardiac workout. Furthermore, due to the low impact of swimming, she is no longer sore after exercising! Winnie looks forward to her two swim sessions each week. They are a special time in which Winnie gets her own one-to-one time with Mom or Dad. It truly is amazing that sometimes the simple changes we make to accommodate one thing turn out to have rewards beyond our wildest dreams. Swimming has provided us a way to keep our relationship with Winnie fresh and mutually enriching for her lifetime. 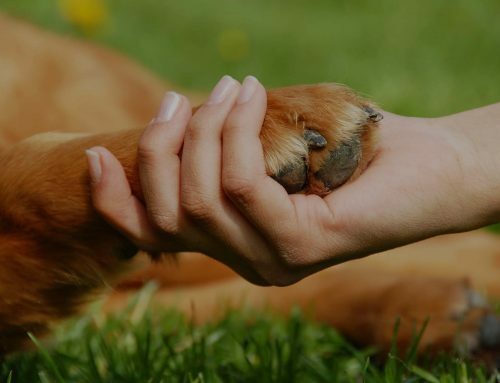 Does Your Dog Love to Have You Reach for Them? 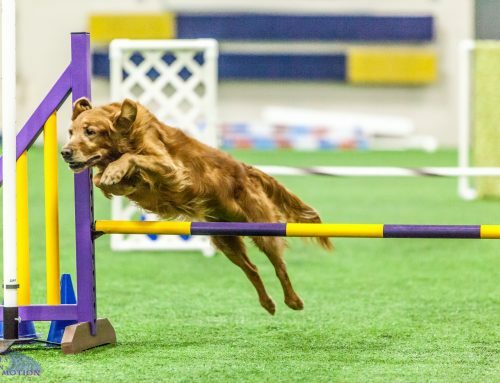 Think Pawsitive, LLC is Wisconsin’s largest indoor canine training and sports complex.